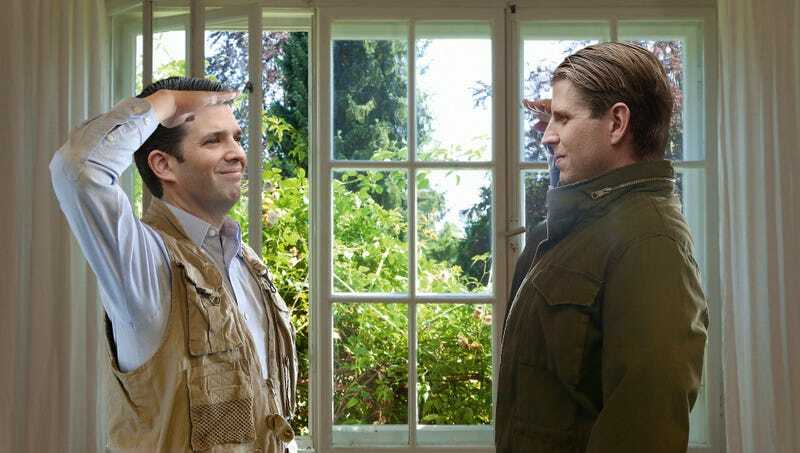 WASHINGTON—Tears welling in their eyes as they faced each other while standing at attention, the Trump boys, Donald Jr. and Eric, exchanged a solemn salute before defiantly leaping from a first-story White House window. “It’s been an honor to serve with you, Don,” said a stoic Eric Trump who opened the window in the State Dining Room in preparation for the brothers’ last great act of glorious rebellion. “Don’t cry, Don, today we are going to bravely escape to heaven. I’ll meet at the pearly gates. Just look for someone who looks exactly like me yelling your name.” White House tour sources confirmed hearing the Trump boys screaming incoherently after the brothers leaped out the opening, fell 18 inches, and became entangled in coniferous shrubs.